I mentioned on my previous post how this swim came about, but now it’s time for the nitty gritty, the actual swim report. 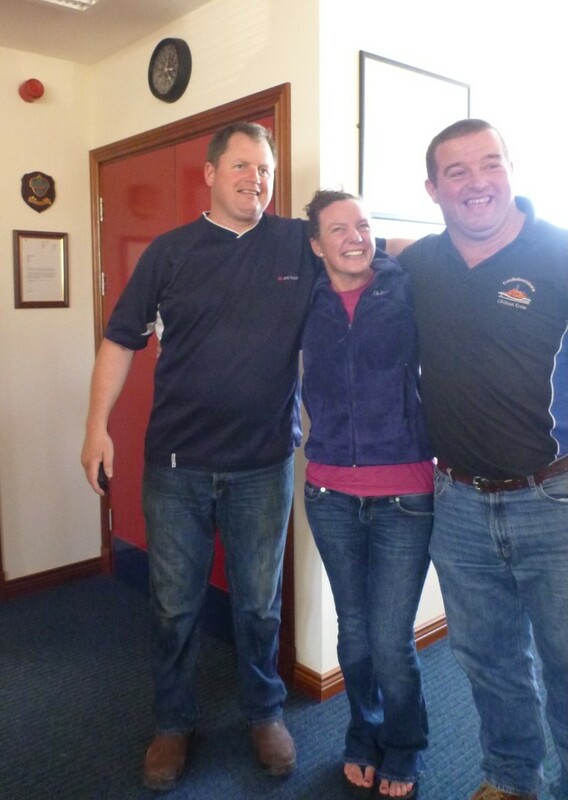 Myself and my own support Crew (Rob, Ray, Owen), went to the lifeboat station on the Friday night to meet the RNLI crew. We went over the maps again, discussed a few ‘what if’ scenarios and talked about the start time. It was agreed we would start about 20-30mins later than originally planned, due to sunrise time. This also gave us a little bit of a lie in on Saturday morning.! I left the lads head off to the local pub, where of course the swim came up in conversation with the locals; they enjoyed the banter (They say!). I was busy mixing up my bottles, recounting my gels, laying out the clothes I needed for the early start etc. I finally drifted off to sleep after playing some cards on my phone to help me wind down. 5.30am Alarm, time to boil the kettle, fill the flasks, pack up the last of the gear, load the car and head to the RNLI station. Not sure what the lads in the RNLI thought of all the bags/boxes we had, but all essentials we told them! (Including one special box of food!). 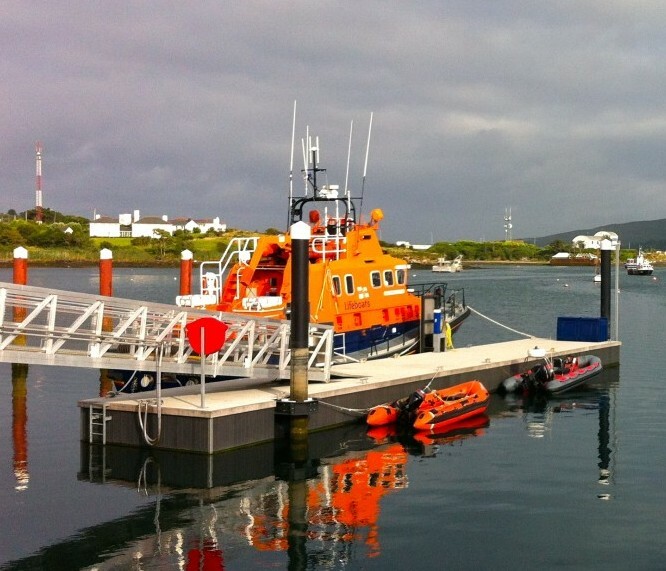 One last chat with the crew at the station and we loaded onto Marneys Rib to head over to Bere Island. 2 of the other RNLI crew (Cian & Alan) also volunteered to follow us along for the swim on their Rib, lucky me, I get 2 boats! It’s only 10mins (2km) out to the island from Castletownbere, with flat calm seas, and a sun trying to peak out for daybreak, we set off with only the sounds of the huge Fishing Boats unloading their catch at the pier. 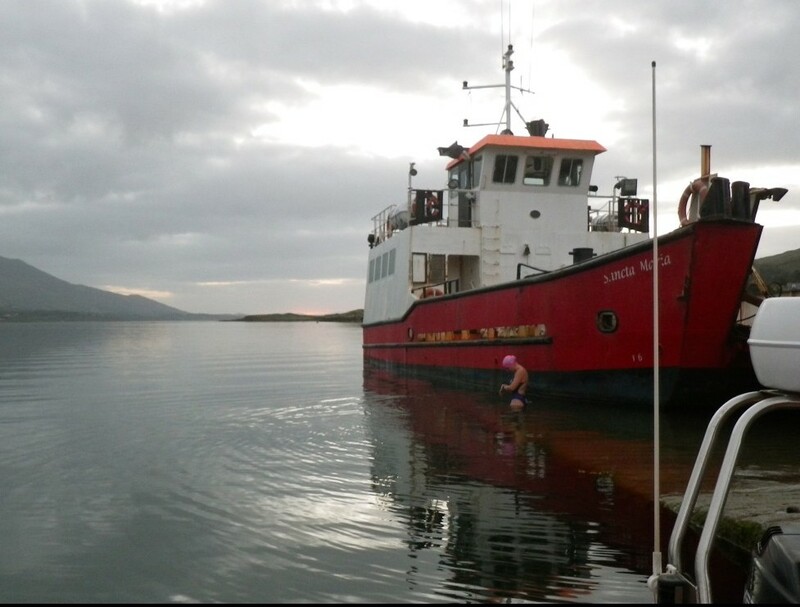 Marney pulled up alongside the slipway on Bere Island, and I hopped out and started getting greased up and ready to go. No more standing around to be done, it was time to swim. I was going Anti-Clockwise around the island, starting from the West End. I was about 1hour before Low Water, this was crucial, as I had to clear the mouth of the harbour (4km) due to strong currents that occur on a flood tide. 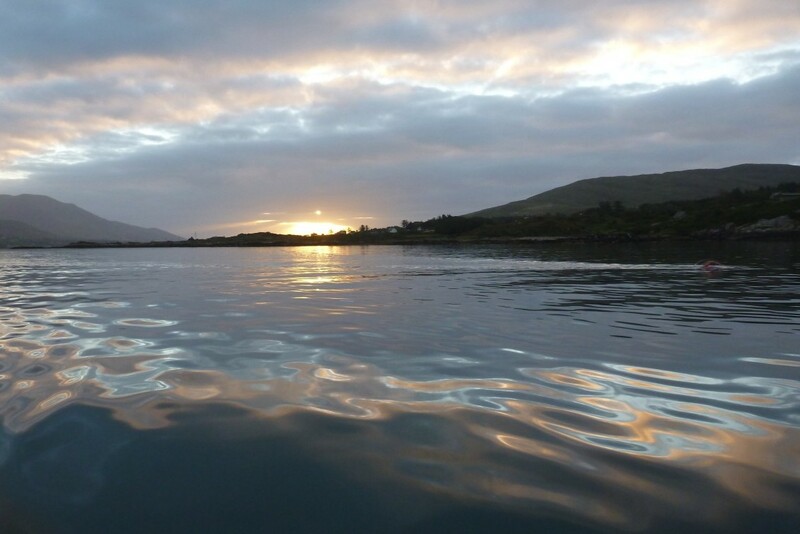 And so at 06.52am I entered the water and started swimming, in beautiful flat calm water. It felt fresh, but it didn’t make me instantly cold. The sun was still not up, but I could see it was trying to make an effort. I love the sun!. 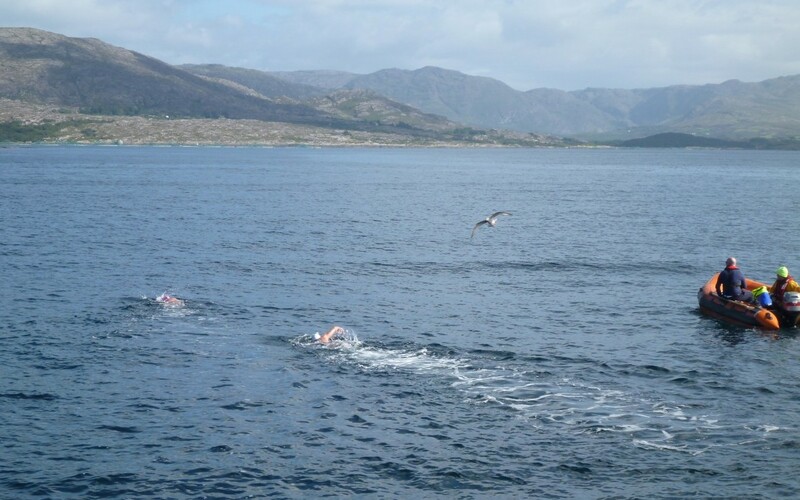 I was happy, flat water, lovely area, 2 boats around me, you know, the thoughts we all have when we start marathon swims, all the nice things….! 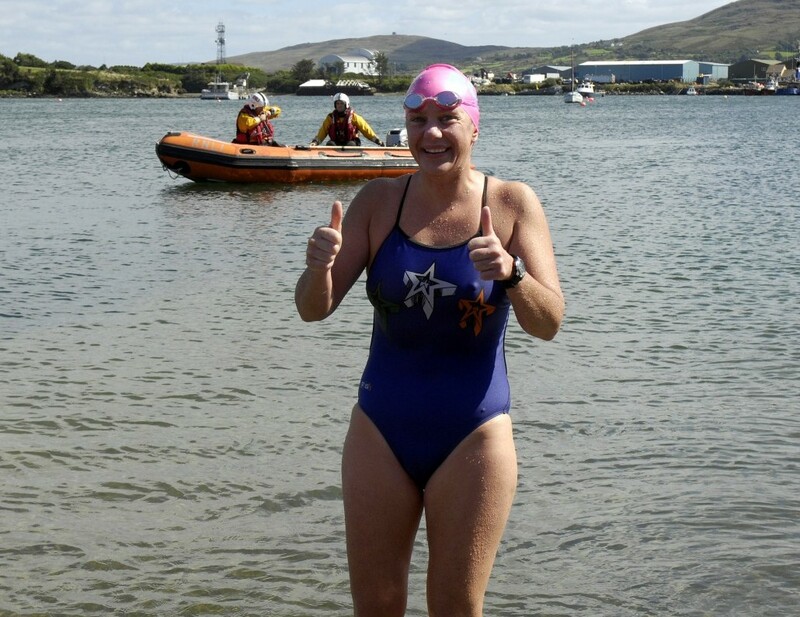 The next 30mins were uneventful, sea conditions were no longer flat, so I knew I must be clearing the mouth of the harbour, water was a bit messy, I could feel my arms doing sloppy pulls under the water, it wasn’t me, the water was doing it, a bit sloppy. 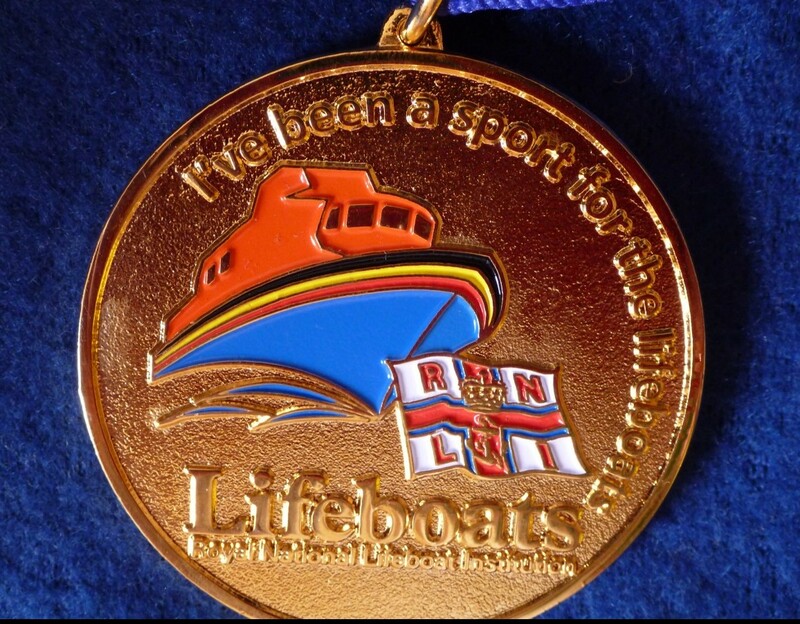 I did think of Ray, oh dear, his first time volunteering to crew for a marathon swim, and it gets bumpy – oh well, he volunteered! Getting my information during a feed stop. Another feed, more information from Rob that we were at 4.5km mark, and on slack water (no more push from the outgoing tide). Lots of clouds still around, Sun not able to make its way out yet, so on the next feed, I asked Marney for the sun, he had promised it for about 8am! And true to his word the sun appeared, for about 10mins and went away again! Tease!. At the next feed I told the crew I was seeing lots of the purple jellyfish and that if they saw me kicking or doing a sidestroke it was just to avoid them, but thankfully as the water was so clear, I had super visibility underwater, I could see the Jellyfish and avoid them in plenty of time, and mostly they were deeper than me. This also kept me alert, I know I was only 2hours into the swim, but something as simple as trying to avoid Jellies is amusement (as long as they don’t sting!). Nothing exciting on the next hour, my jellyfish were gone, the slack water was wavy, and I was doing ok with less than 2km covered per half hour. I could see the lads taking lots of pictures from the boat, but I now know they were for the loneswimmer, he loves his caves and arches, and we were passing loads! The next 2 hours were hard, it’s the mid swim SIGHHHH part of the swim, the part when the mind wanders, the stroke gets a big sloppy and you question why are you doing this. Thanks to my super swim crew, they spotted the signs and gave me one hour’s notice that Owen was going to be joining me for a ‘support hour’. For the next hour I tried to work a bit harder, I didn’t want to be slowing down and let Owen get cold swimming at my slower speed. So I kept my SIGHs to myself, and swam towards the never ending corner of the East End of the island (Sloping rocks for about 2 hours is crazy mind games of ‘where is the turn’). 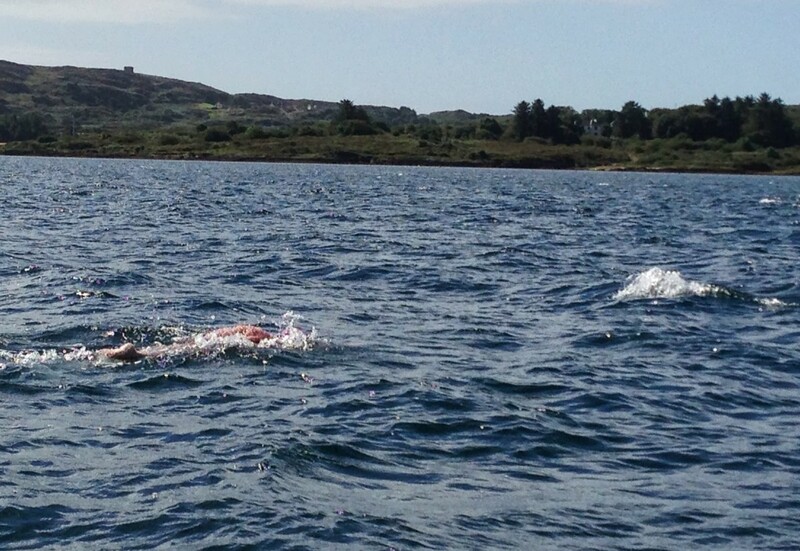 Owen dived in, the sun started shining, and the water got even warmer as we were nearing the turning point at 15km. My instructions were to stick with Owen, he would guide me to the corner, he knew where he was going, having picked the points to sight from the boat. There are some times when you have to actually stop and take in where you are. While Owen & I were doing what we know best at a corner (IE: taking it really tight over the rocks – Sandycove style), we ending up looking at fantastic underwater scenery, the clarity was the best I had seen it all day, I knew Owen would be in his element, an Ecology Student in UCC, and this is the hour he has to swim, full of things to look at. We got a bit distracted at one point and got too shallow, stood up, laughed, and flopped back onto the water again to continue checking out what was under us! This made a huge difference to my mood, I perked up, knowing that we were just about to turn the corner. Owen Left once we got around the corner and on next feed the crew told me, 8km to go, I smiled, no bother I said, home stretch. 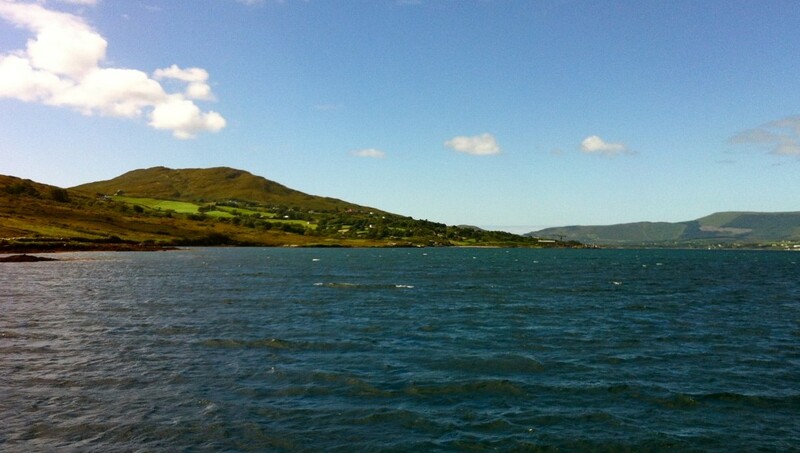 Heading for home, Bere Island on the left, Mainland on the right. I was on 20mins feed intervals now which were nice, having done the same during my MIMS swim, I knew this would make the time fly by to the end. BUT I had nearly forgotten that the winds were NW, that ment, head wind & Chop all the way back to the other end of the Island. I asked the crew if it was more sheltered closer to the island or to mainland on the other side, NOPE they said, the chop and waves were everywhere, may as well stay in the middle channel, OK I said, head down, time to swim on. Just some waves and chop to content with for 8km! The stroke had to change during this section, I could no longer swim the ‘perfect’ stroke with bent elbow, it was now swing the arms high to clear the waves. 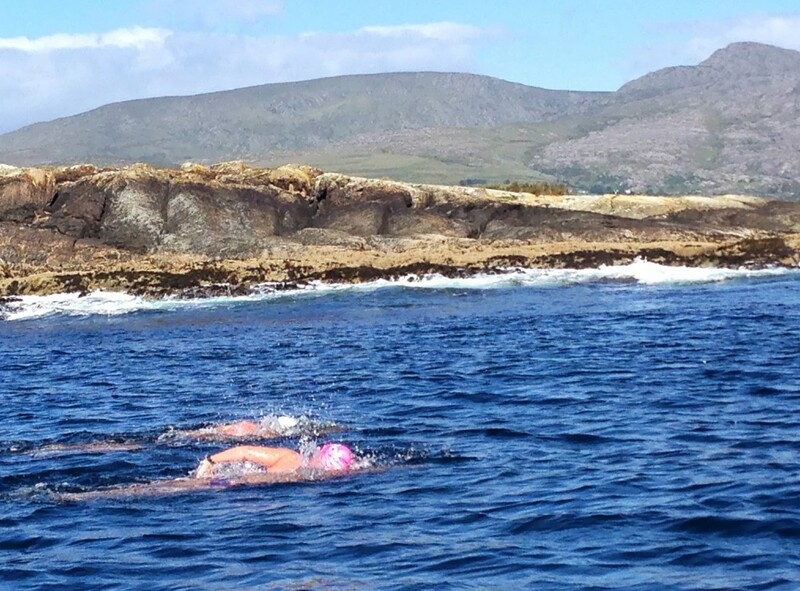 I Was trying to think about the stroke more, but in the waves it was hard, I’d get a good stroke followed by a twisty short stroke, oh well, swim on, and in my head I knew I’d pay the price of the NW winds on my shoulders later! The feedback from crew was still ongoing on the quick feed stops, they called out Facebook & Twitter messages to me, including that Damian (Myrtleville Damian!) 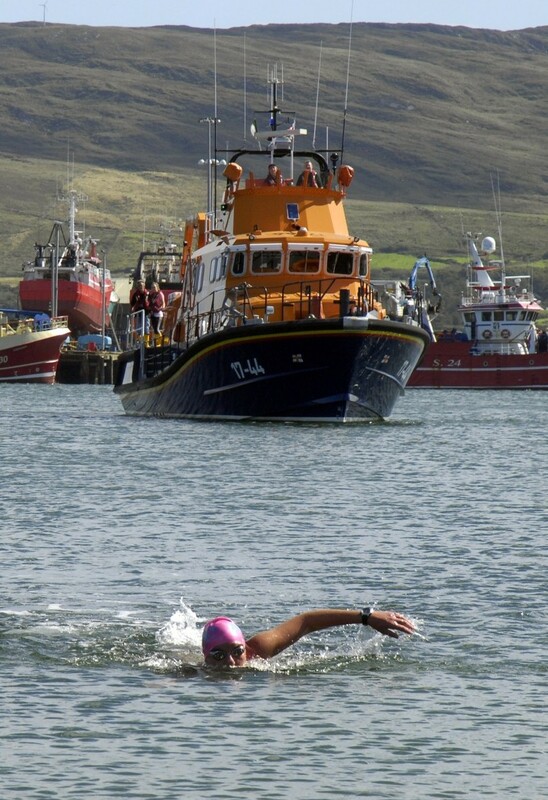 even joined twitter to follow the swim!- awww thanks, that amused me for 20mins while I ploughed through waves. 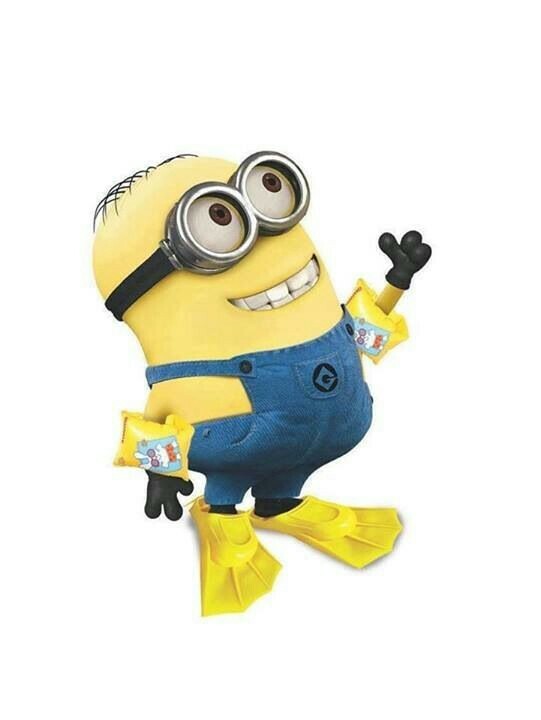 This is why I need information, I want to process something from feed to feed, whether it be good or bad, I need to keep the brain busy, otherwise I wander off picturing the Crew as Minions! 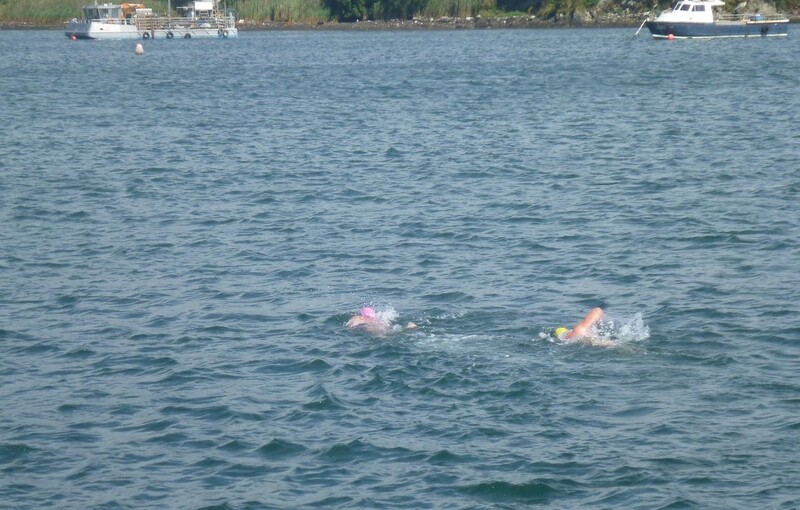 I knew I was slowing at this stage, Rob told me I covered 1km since last feed, as I took my drink I could feel myself being pushed slightly backwards, and a house I picked on the island to swam to for last 20min was now ahead of me again. I had a talk with myself and decided to dig in, some boats were now following along too, I couldn’t let the tide or wind stop me, I’m better than that I thought, so I dug deep. 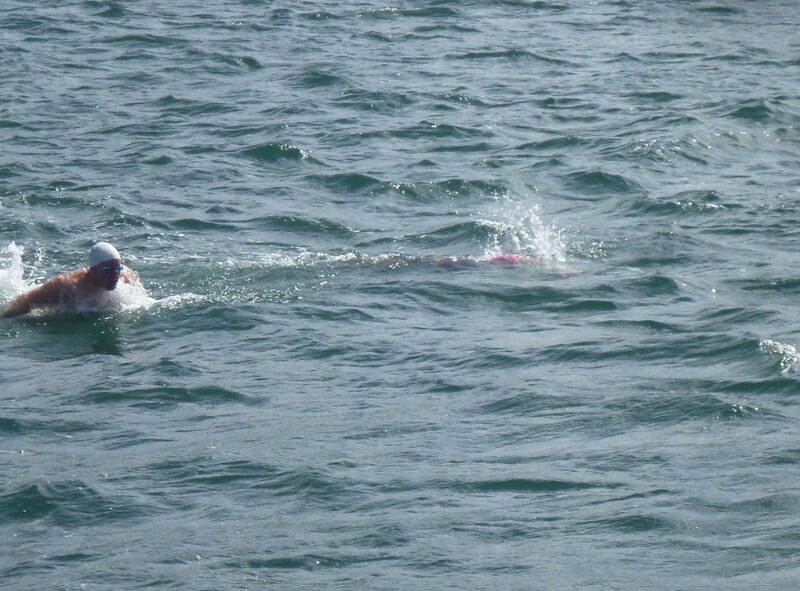 Again, the crew saw what was going on, I was swimming well, but just not covering the usual ground I do per 20mins, so it was Rays turn to join me for support. 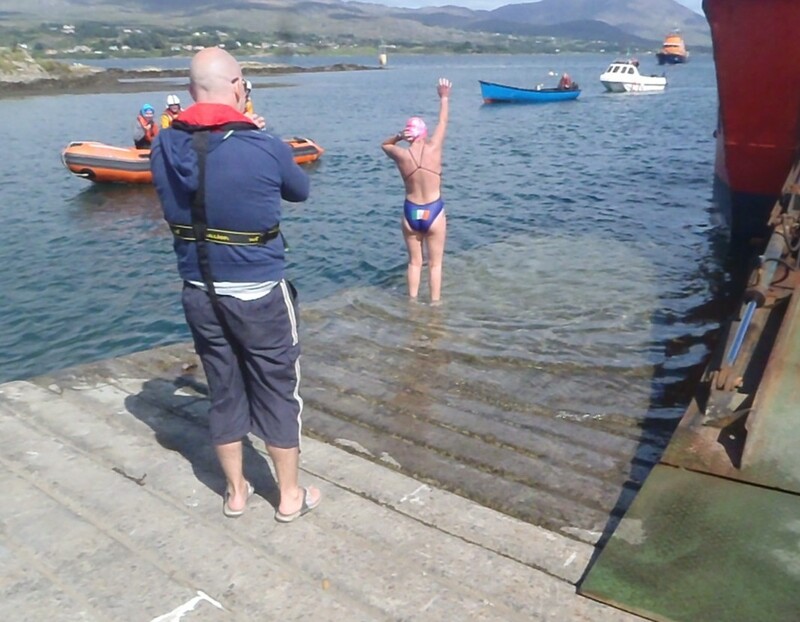 I was waiting for the reaction from Ray, the water was no longer the temperature it was earlier, it had significantly dropped again, and then the chop, I know Ray is a super swimmer, but cool choppy water is not his favourite conditions to be in. He dived in without a swimming hat (A- because he had forgotten to bring one, B- it was sunny, he thought he’d be ok), 2 minutes later Ray swam back to the boat to borrow Owens swim hat, I’m telling you, the simplest things amuse a marathon swimmer after a hours in the water, and this made me chuckle for at least 10mins. 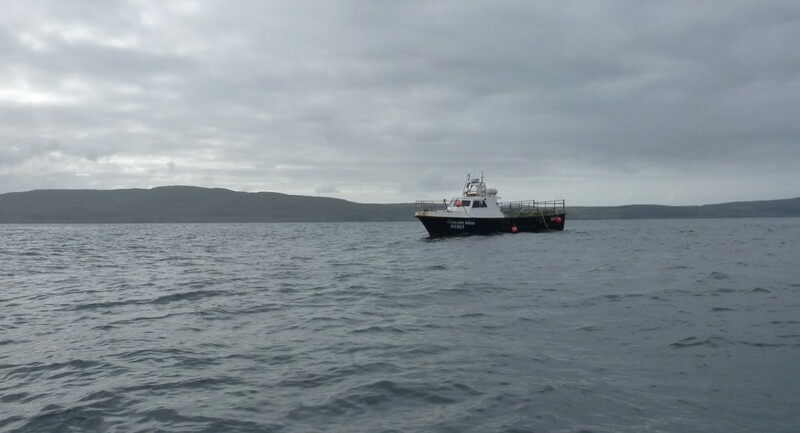 It was great having Ray in the water, we had a flotilla of boats around us at this stage, but we were heading for a large fish farm that needed to be avoided, so again, I took the instruction of letting Ray guide me around the fish farm. Ray even decided to do a few strokes of Butterfly, not sure why, he likes Butterfly in the pool, maybe he was trying to amuse himself. My mind did wander to Sylvain though, in 2 weeks he is hoping to swim the English Channel in Butterfly — YES 21miles of Butterfly in the sea. I wish him HUGE good luck with it, A Hero for even attempting it. My own personal Flotilla – watching this mad one swim around the island! FINISHED – 🙂 acknowledging the flotilla support! 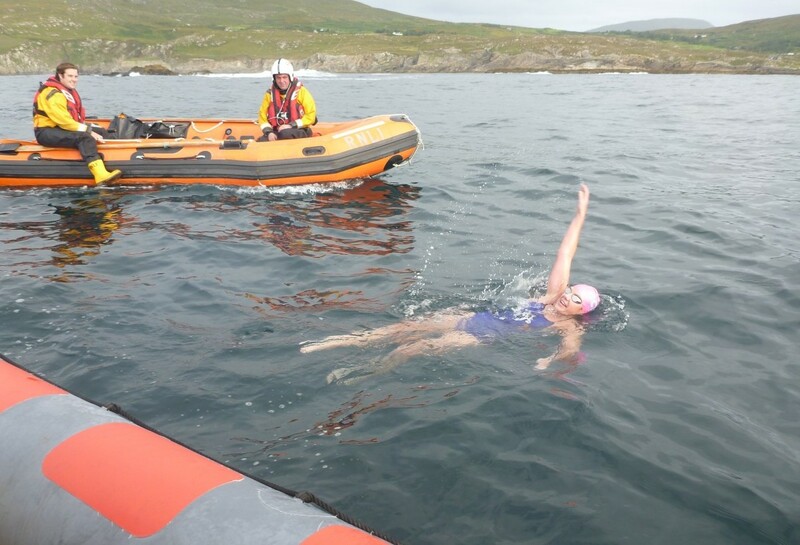 I had the usual marathon swim stagger trying to stand up, but Rob says it was a graceful wobble!, I turned to acknowledge the flotilla and the Lifeboat support, thanks for the company. 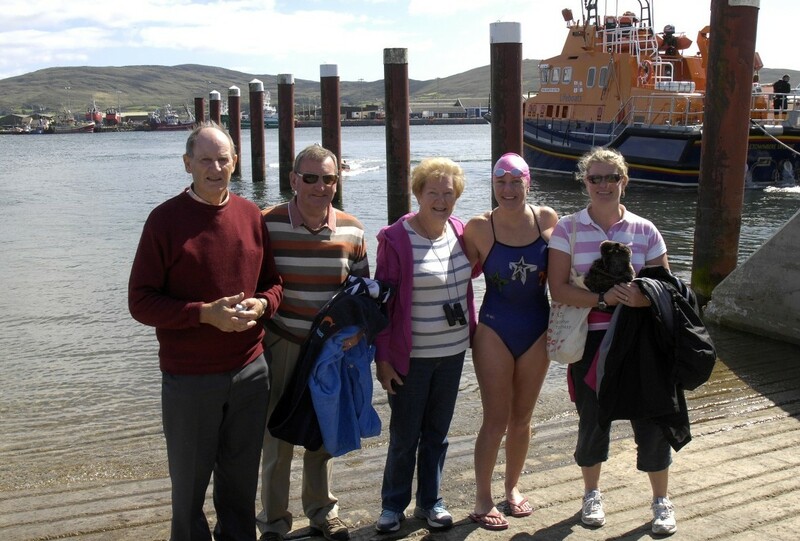 My crew bundled me up in my warm parker jacket, and after a few minutes on the slipway, I jumped onto the RIB and took a spin out to the big lifeboat, Rob and I climbed aboard and got ready to swim the last 800m back into the Castletownbere slipway where my family and friends were waiting. It was lovely to hear the hooting from all the boats as I finished back on land. A few media shots later and the crew of the Lifeboat station opened the doors for me to have a shower and change. Then upstairs we went for a feed of Sandwiches and Tea put on by the volunteers of the RNLI. It was totally unexpected but it made a huge difference for getting me warm afterwards. This is also the place where we started comparing stories! 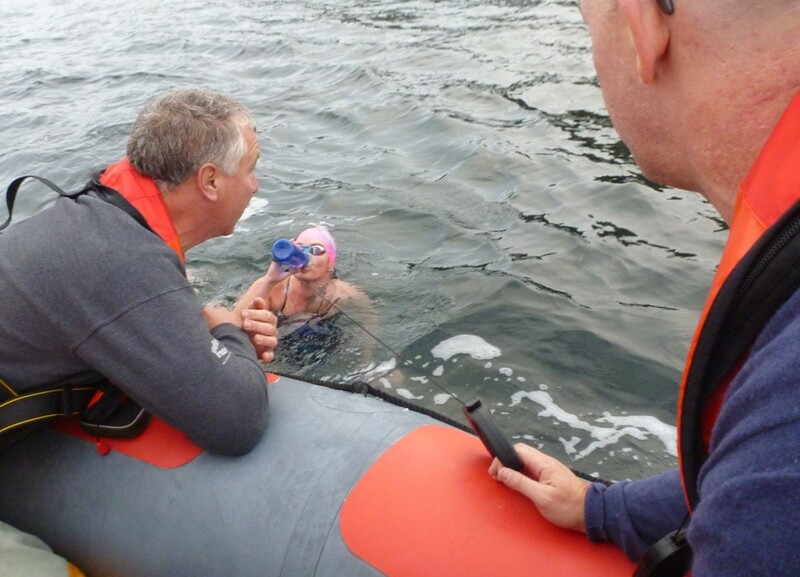 Rob asked how I found the water, I said fine, he admitted he lied about the temperature, he had told me at my first feed it was 14.3deg at the start, in fact it was only 13.3deg (56f), and was 13deg for most of the swim, it did get to 14 for a bit and even touched at 16.0 briefly when we were at the shallow part over the rocks at the East End (Owens Hour), but finished back at 13deg again. Thanks Rob! I know I said I like information when I swim; real information is obviously only on a need to know from Rob! It did me no harm. To View all my photos: I have made a facebook album, here is the link: you don’t need to be a member to view them! 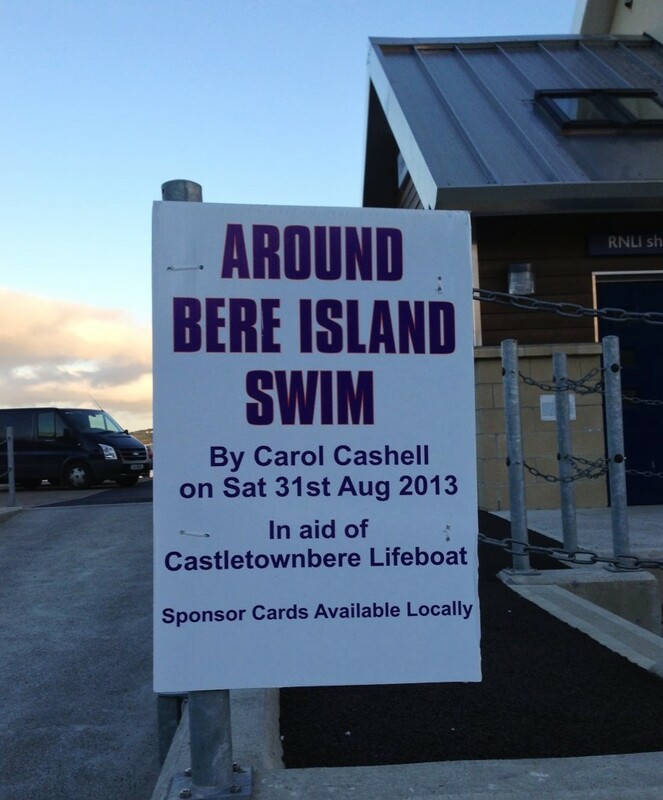 I was presented this by the Castletownbere Lifeboat station. I love it.